First game for the mens in round 18. What a close contest this game was. Both teams defensive structures were dominant and held up well under pressure. The wolves were able to get the first score of the game five minutes into the first half. Brunswick calling a timeout with 12 minutes remaining in the first half. Brunswick coach gets into a heated discussion with his players about what they are doing wrong when going forward. Both teams have had shots on goal and missed with both keepers doing well to block shots. Play resumes and Brunswick continue to shoot hoping to get a reward with the ball behind the net, but struggle to get that. With the ball being turned over from both teams Wolves were able to get some reward for effort. Going on to score another two goals before half time. Play resumes and Brunswick find themselves under pressure being three goals down with one half remaining. 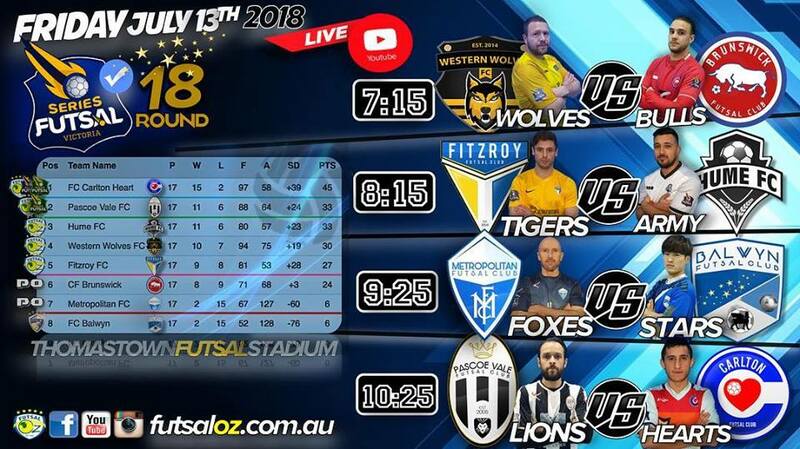 Western wolves went on to score another two more goals. With 12 minutes remaining in the second half Brunswick call a timeout. Players and coach asking for everyone to lift. Yet to score, they have a number of shots on goal but blocked very well from Western wolves keeper. Brunswick not giving up, determined to at least get one goal in the back of the net before the end of the game. Five nil down Brunswick continue to press forward. Western wolves defensive structure continues to impress. With six minutes remaining on the clock finally get some reward for effort and Brunswick score their first goal for the night. With under a minute remaining Western wolves kick another goal and get the win. First half made for a very tight contest with only one goal scored by Hume six minutes in. With majority of play in Fitzroy’s attacking end Hume’s defensive and keeper did very well to hold up Fitzroy and not let them find the back of the net. Hume’s counter attack and finding space when going forward was the reason they were able to score. Hume’s keeper found himself blocking shots from many different angles. Communication amongst players and coaches was key something both coaches did very well. Time out was called by Fitzroy for them to regroup and work out a way to get the ball past the keeper. They were awarded a free kick before the timeout. Fitzroy took the shot but failed to score. Fitzroy was kept scoreless in the first half. Second half under way and with in thirty seconds Hume on the counter were able to find the back of the net. Giving them a two nil lead early in the second. Fitzroy under pressure but continue to press. With 10 minutes remaining Hume again able to score pushing their lead out. Fitzroy left confused and wondering how they can come back from this. Time out called giving both teams a breather and time to think of how the next 10 minutes can pan out. Fitzroy able to score with seven minutes remaining giving them a sniff of a chance that they could cause a comeback. After that goal the game gets more intense and every shot on goal gets more and more exciting. Fitzroy need to find two goals and Hume want to continue to put the pressure on Fitzroy by scoring. With a minute forty left on the clock Fitzroy able to score their second goal. A comeback equaliser goal is what they are searching for to send the game to penalties. 36 seconds left Fitzroy with the corner needing to score. They fail to score, Fitzroy left their comeback to late in the game. Hume come away with the win. Second last taken on last. Game begins and Metropolitan come with a point to prove that they will not finish last. Not even two minutes in and they go on to score two goals so early in the first half. Breaking the hearts of Balwyn who find themselves under pressure and two goals down already in the first half. With nine minutes remaining in the first half Balwyn able to score giving them some confidence going forward that they can comeback and win. Timeout called and frustrations between players start to show but both teams asking for more and are not giving up. Balwyn after that time out score again. Scores are level in the first half 2 all. Game on for both teams. Pressure starts to intensify as the game goes on and the belief in both teams is still there to find the winning goal. A double save from the metropolitan keeper keeping metro in the game. Balwyn continuing to push forward hard and have shots on goal. Metro struggle to get it past the half way line, when they do their shots on goal are far wide. With under a minute remaining metro score giving them a one goal lead into half time. 30 seconds into the second half and Balwyn again scoring levelling out the scoreboard for the second time in the game. With 14 minutes remaining in the game Balwyn with that fighting spirit able to score again. Coming back from a 2-nil in the first 2 minutes of the game Balwyn find themselves in front for the first time in the game. Can they hold the lead is the biggest question. The crowd getting behind every goal. Balwyn lead was shortly lived, with Metro going on to score three minutes later to level out the game for the third time. A controversial red card given to the metro keeper after the referee notices him wearing a black ear ring. Crowd booing and metro team mates getting very frustrated with the decision letting the referees know about it. With three minutes remaining in the game Metro able to break the deadlock and score. That goal giving them the win over Balwyn. With five minutes into the first half Carlton able to hit the scoreboard first. Both teams rely on turnovers and their counter attacks to have shots on goal. Both keepers kept busy early in the first half. With minutes remaining in the first half Pascoe Vale able to level out the score line and get their first goal of the game. 30 seconds later Carlton was awarded a penalty kick and converted into a goal. With under a minute remaining from the corner Carlton again able to score giving them a 2 goal lead at half time. Pascoe Vale with the pressure on need to find time and space and convert their chances into goals. Pascoe Vale able to score twice in the second half. But Carlton still able to score and keep the lead of two goals. Pascoe Vale a man down after a player was red carded for verbal abuse towards the referee. Team mates left confused, however half of the crowd cheered and half booed the referee for the call. Carlton able to find the back of the net and score again with six minutes remaining giving Carlton a 3 goal lead. Making it harder for Pascoe vale to came back and win. Carlton give away a penalty, and Pascoe Vale and score. With four minutes remaining and two goals down Pascoe Vale have the belief they can turn it around. 30 seconds later Pascoe Vale score again. Only one goal difference, Pascoe Vale continue to press, and score again to level out the game. What a comeback from Pascoe Vale can they hang on and find that winning goal, or will they make it go to penalties. With under a minute remaining Carlton had the shot on goal to score and win the game and miss. Sending the game to penalties.